Topics: Vehicle Opening, Lost, Stolen Car Or Keys, Vandalised, Seized Or Worn Locks, and Spare Keys. 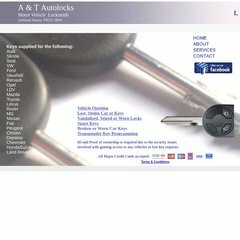 A-tautolocks.co.uk's IP address is 84.22.162.129. It is hosted by Iomart (Scotland, Glasgow,) using Zeus/4 web server. PING www. (84.22.162.129) 56(84) bytes of data.